Think today’s student-athletes have it rough? Faye Perkins (’79 physical education, MS ’85) can put it in perspective for you. Back in her day, the Cyclone women’s basketball team did all of its practices and played each of its games in Forker Hall – and if they had 20-30 people in the stands for the game, that would be a good crowd. During her junior year, the women’s team got to have one practice and play one game in Hilton Coliseum. But Faye and each of her teammates had to sell 20 tickets. “Back then, we were just happy to participate,” Faye says. Participation in women’s and girls’ team sports was certainly not a given. Faye remembers that she and her classmates had to petition to have a girls’ basketball team at her Cresco, Iowa, high school. Once they got their team approved, the girls were relegated to practicing in the pole shed at the county fairgrounds. This was back in 1972, just at the start of the Title IX program. Things were beginning to change in girls’ and women’s sports – for the better. Faye applied to Grandview College and received a scholarship to play basketball. But two weeks before school started, Chris Murray, then Iowa State’s head track and field coach, called her on the phone. “He said I had to come to Iowa State,” Faye remembers. Murray must have been persuasive, because Faye changed her enrollment to Iowa State and never looked back. She ran track and field and was a member of the basketball team during her freshman year. In her sophomore year, she dropped track but added softball. Her abilities in multiple sports won her a place in the Iowa State Athletics Hall of Fame. Faye was also one of Iowa State’s first female athletic scholarship recipients. Upon graduation, she went on to earn a master’s at Iowa State, followed by a Ph.D. from the University of Utah. She has taught physical education at the K-12 level and has been a head volleyball, basketball, track and field, and gymnastics coach at the middle school level. But softball is her one true love. 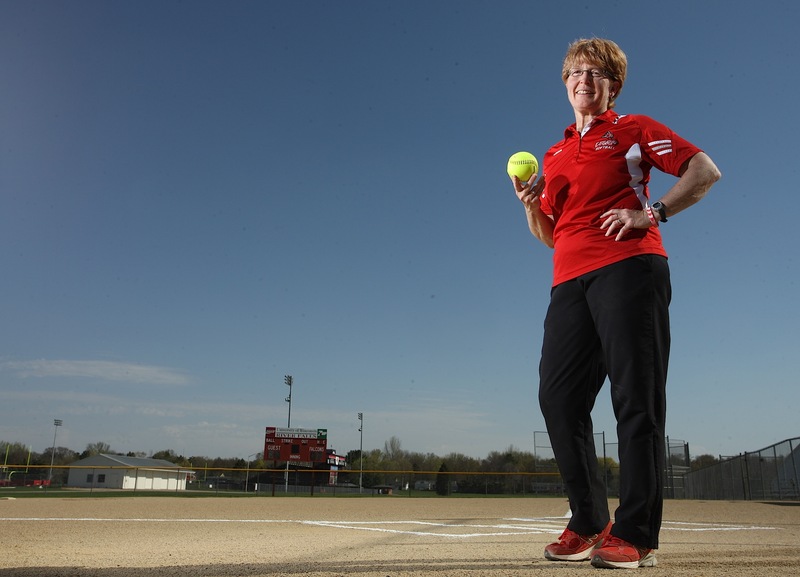 She coached high school softball, and in 1988 she became head softball coach and an assistant professor in the Health and Human Performance Department at the University of Wisconsin-River Falls, where she remains. Over the years she has been an assistant to the vice chancellor for faculty development, department chair, and interim dean of the College of Education and Professional Studies. But she’s most proud of her coaching: her softball team last year made it to the NCAA Div. III regional championship game. “My job combines my love of academics with my love of athletics,” Faye says. She said that one of her proudest moments was when she got the phone call in 2004 from the ISU Athletics Department telling her she had been chosen for the ISU Athletics Hall of Fame. “I could not stop crying,” she said, smiling happily. Faye and her husband, Joe, have two sons, Paul and Robert. Dr. Perkins is an inspiration. I had the honor of her being a part of my life during my college career and she made an unimaginable impression on me and how I want to lead my life. She is the main reason I am doing what I am doing today, teaching Physical Education in a high school. Without her constant and continuous guidance along the way, I may never have graduated. Thank you Dr. Faye Perkins for being a great role model and an outstanding human being.